In 2015, a significant amount of research was dedicated to better understanding what I believe is the least understood of the major types of dementia. That type of dementia is Lewy Body dementia. This post will will begin to summarize the findings of this latest research in way that is both accessible and will hopefully better educate us as caregivers of loved ones with Lewy Body dementia. One of the most difficult aspects of identifying someone with Lewy Body dementia, until now, has been this type of dementia’s sometimes-overlapping symptoms with Alzheimer’s Disease and Parkinson’s Disease. Additionally, until now, the only way to identify Lewy Body dementia behaviorally has been R.E.M. 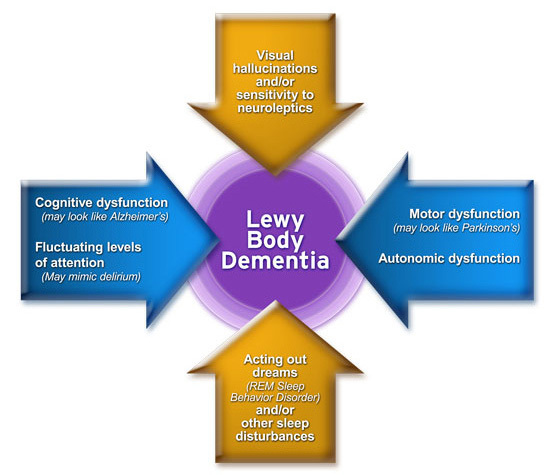 sleep behavior disorder symptoms and the prevalence of auditory and visual hallucinations that outlasts this normal step in the journey through dementias and Alzheimer’s Disease, and the only way to confirm Lewy Body dementia definitively has been to see the Lewy Body protein deposits in the brain post-mortem. Now, however, as neurology and technology have advanced to give more concrete and detailed access to living brains at the microlevel, we have more complete information about the distinct identity of Lewy Body dementia as scientists gain insights into what kind of underlying protein pathology leads to which symptoms of Lewy Body dementia that emerge, as well as how quickly Lewy Body dementia progresses. The newest research on Lewy Body dementia was presented at the International Dementia with Lewy Bodies Conference held in Fort Lauderdale, FL from December 1 through December 4, 2015. The neuropathology presented at this conference is based on imaging data and tissue and/or cerebral spinal fluid (CFS) samples that started with people who had Lewy Body dementia behaviors while they were living and whom, after death, had post-mortem confirmation of Lewy Body proteins in their brains. The focus of this research is to understand the diversity of Lewy Body dementia (evidenced by different symptoms at different times in different people). 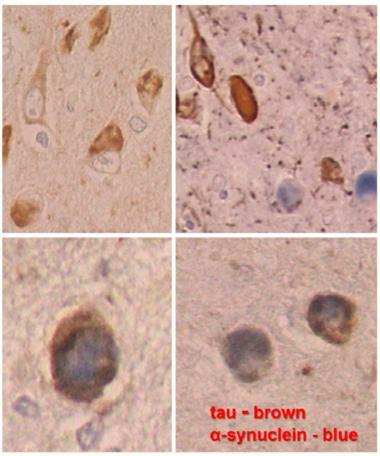 Since Lewy Body dementia symptoms and progression are the result of the accumulation of at least three toxic neurological proteins – α-synuclein, tau and Aβ (amyloid) – in different regions of the brain, at different times, in different people, researchers are honing in on determing what each pathological protein contributes to the disease during life. To understand the new research into Lewy Body dementia, we must briefly review the research on these three toxic proteins that has already been done. The neurological staging of Parkinson’s disease involving the α-synuclein protein was identified and described by Heiko Braak in 2003. The main pathological characteristic of Parkinson’s Disease is cellular death in the substantia nigra and more specifically the ventral part of the pars compacta, affecting up to 70% of the cells by the time the patient dies. While the mechanisms that cause cellular death vary, one particular mechanism occurs with an abnormal accumulation of α-synuclein which binds to ubiquitin in the damaged cells. This protein accumulation forms inclusions called Lewy bodies. Braak’s staging shows that Lewy bodies first appear in the olfactory bulb, medulla oblongata and pontine tegmentum. In this stage, there are no symptoms. As Parkinson’s disease progresses, Lewy bodies begin to appear in the substantia nigra, areas of the midbrain and basal forebrain, and finally spread to parts of the neocortex. Braak used the research of Kenji Kosaka, who categorized three kinds of Parkinson’s Disease. The first kind was limited to the brainstem, which corresponds with Braak’s first three stages. The second kind was a transitional type with neuropathology concentrated in the basal forebrain, which corresponds to Braak’s fourth stage. The third kind was a diffuse type with Lewy bodies in the cortex, corresponding to Braak’s fifth and sixth stages. The problem with neat categorizations and stages is that real people don’t fit neatly within them. This has been, and no doubt will continue to be, the difficulty with doctors and neurologists determining a Lewy Body dementia diagnosis. What makes Lewy Body dementia even harder to diagnose is when it coexists with other forms of dementia, which affect other parts of the brain or the actual structure of the brain. This simultaneous presentation of a mixture of symptoms (hence the term mixed-dementia diagnosis). Some of the research from the conference gave some interesting insights into how the toxic three proteins – α-synuclein, tau and Aβ – coexist in the brain and their pathology intermingles making a precise diagnosis of each form of dementia difficult (observed symptoms and behaviors, it turns out, are still the most reliable gauge). About one out of five people who have Alzheimer’s Disease also have Lewy Body dementia. Alzheimer’s Disease shrinks the brain – essentially, the brain becomes fossilized as the brain’s cells are choked to death by the tangles of tau and the plaque of Aβ (amyloid) – but in one-fifth of the cases of Alzheimer’s Disease the presence of α-synuclein is detected in the amygdala (where tau starts wreaking its havoc on the brain), which is uniquely susceptible to both proteins. Additionally, the olfactory bulb is also very susceptible to this α-synuclein/tau one-two punch, frequently occurring in the same people who have it in the amygdala (both the olfactory bulb and the amygdala are part of the brain’s limbic system). The brainstem (which is not part of the limbic system), however, which is emblematic of Parkinson’s Disease, is usually not affected in cases of Lewy Body dementia involving both the olfactory and amygdala. What this tells us is that Lewy Body dementia has a different staging system than Parkinson’s Disease: in many people, most of the initial α-synuclein pathology occurs in the limbic system, and it progresses outward from there up into both the association and primary visual cortex and down to the autonomic system. When the third toxic protein – Aβ (amyloid) – is thrown into the mix, all bets are off when it comes to any kind of systematic staging or sequencing process neurologically. The presence of all three of these toxic proteins simultaneously – and the speed with which they affect the brain and where they are in that process – leads to a countless number of ways that the dementias present themselves in each individual. So, in the end, just as each of us are unique creations, this uniqueness in how dementia affects each person at the individual level (all dementias have a common and progressive set of steps in the journey and all share some big-picture features in common) becomes evident. In the majority of people who present clinically with Lewy Body dementia symptoms do not present those symptoms in a vacuum (in other words, a single dementia diagnosis of Lewy Body dementia is very rare). 90% of people exhibiting symptoms of Lewy Body dementia also have the tangles and plaques of Alzheimer’s Disease, and 60% of those have a high burden of plaques. Among people diagnosed with Parkinson’s Disease dementia (PDD) – the dementia risk in people with Parkinson’s Disease is relatively low, with 40% showing no tau and Aβ (amyloid) in the brain and the other 60% not likely to accumulate these two toxic proteins in the brain – only 1/5 have a pure α-synuclein disease. The majority, on the other hand, have a simultaneous α-synuclein and Alzheimer’s Disease pathology, and many of those have a heavy amyloid burden. 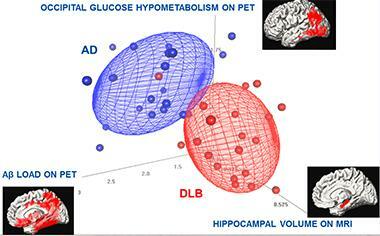 Another insight that the new research has found relates to time and progression of Lewy Body dementia. Researchers looked at people with both transitional (limited area in the brain and not affecting the cortex) and diffuse Lewy Body disease (widespread areas of the brain including the cortex) and rates of progression of Lewy Body dementia. The findings show that people with diffuse Lewy Body disease and a heavy concentration of tau decline the fastest neurologically with Lewy Body dementia. Researchers then further divided the groups of people with diffuse Lewy Body disease into those with heavy and low burdens of tau. The findings shed a lot of very specific light on the different variations of Lewy Body dementia. The researchers discovered that people with a lot of tauopathy along with their synucleinopathy not only progressed fastest, but they also manifested worse memory loss, were more likely to carry the APOE-ε4 gene (the Alzheimer’s Disease gene), and to be female than people who had Lewy Body disease with a low tau burden. These people were also less likely to have R.E.M. sleep behavior disorder. Additionally, heavy burdens of both tau and Aβ (amyloid) occurring along with a heavy burden of synuclein had extensive damage to the hippocampus and the fastest mortality rates. The upshot of these findings show that a higher presence of both tau and Aβ (amyloid) in people with Lewy Body disease makes both dementias worse and more destructive in a shorter period of time. In the next part, we’ll look at more of the research on Lewy Body Dementia that came out of this conference. Well Sandra I think you did a lot of research on this article and that in fact you are an extremely intelligent person. I tried very hard to follow this article, but often had to back up and reread to get it to sink into my brain. 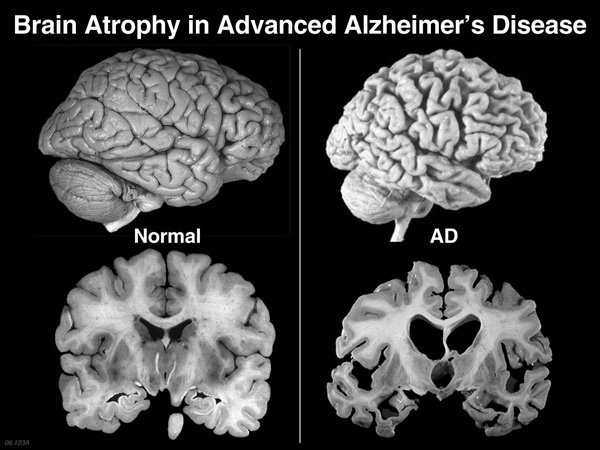 I liked your charts of the brain, the different periods of activity and the last chart of Brain Atrophy in advanced Alzheimer’s Disease. I knew these type of holes appeared in the brain. I never knew what type of dementia my brother had. I do know from the time he was diagnosed to his death was a period of 6 years. During his last 6 months of life he was in and out of the hospital constantly and I could see a fast decline in his health at that time. This is a fantastic post and I am looking forward to reading part 2. I enjoy this kind of research and I’ve been doing it long enough in the neuroscience/neurology field that it makes sense and I gain a deeper understanding of “what” and “why” in dementias. Not intelligence, per se (if I have any, God gets the credit because He made me and He gives the gifts, so I certainly don’t get any credit myself), but a passion to try to make this kind of understanding accessible to a wider audience. Because we so often see – and I do on my support group a lot – the “what” and “why” questions, I hope that distilling the very technical aspects, in combination with my Laypersons’ guides to the various kinds of dementia, will help answer some of these questions at their very foundational level. Knowing what each part of the brain controls and then knowing how they get affected and by what explains behaviors (I also do a lot of this in my book on the journey through dementias and Alzheimer’s Disease) we see in different types of dementia. My hope is always, in the end, to remind caregivers and others that it’s not our loved ones’ fault but instead that what is happening to the brain – these three proteins, for example – is what is causing the behaviors and the symptoms. For me, knowing that produces compassion, empathy, and patience (although it always brings a component of grief as well because we know these people were once not like this and we hate to see them have to endure it), which I believe are the big-picture things that all of us as caregivers should grow in as we walk through the journey with our loved ones.